Uprooting your whole life and moving to another country can be difficult for anyone with so many new things to adjust to. This is all familiar to Neil Collins, Founder of Bristols Cider, who moved to California from Bristol, England. Upon arriving in California, Neil realized that hard cider had not really caught on in the United States. This became even more evident as he searched liquor store shelves for cider, only to come up empty handed. In 1994, Neil decided that he was going to start making cider. Hailing from Bristol, a very well known cider area in England, and being a winemaker by trade, Neil was no stranger to the cider making process. He created his first ciders under the Bristols Cider brand - basic bottle fermented ciders, nothing fancy, just good straight forward cider. However, in 1994, the demand for hard cider was just not what it is today in America. Neil ended up with a lot of great product that, unfortunately, few were interested in buying at the time. Neil kept on honing his craft and continued to create exceptional ciders until the market finally started to shift in his favor. Cider sales started creeping up - slowly at first then finally hitting a boom. From 2012 to 2013, Bristols Cider production jumped from 900 gallons to 2,500 gallons. Now in the American cider renaissance, consumers really cannot get enough cider! Neil was joined by his wife Marci and sister Jackie who helped shape Bristols into a fully functioning business, and now help in every aspect of the cider company. Neil is also joined by Adam Welch, who does much of the cider production and is also a very talented artist and Chef de Cave. Neil and his team can usually be found in their Atascadero, CA cider house where all of the ciders are thought up, produced, bottled, and sold. All of the ciders are made from locally grown apples; Neil chooses organic varieties when available. The cider house is located in a warehouse which Bristols has personalized to include a large graffiti mural. The mural takes up an entire wall and was created by none other than the artistic, Adam Welch. Their cider house includes a pub and tasting room, which is open to the public and has up to eight ciders on tap at once. 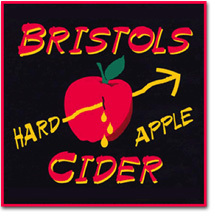 Bristols Original: 7.5% ABV – Bristols’ flagship cider consists of locally grown Ida Red, Braeburn, and Granny Smith Apples. This cider is described as dry with only a subtle sweetness. It is fermented in stainless steel with ambient yeasts stopped at low sugar. This is a crisp cider with slight carbonation. Brigstock: 7.5% ABV – This cider is based on the original with the sweetness turned up a little bit. 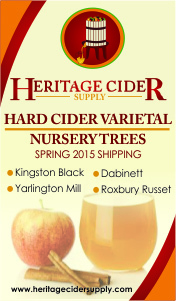 The variety was added in 2014 to accommodate those who like a sweeter cider. The production process is very similar to the Original. Barti Ddu: 7.5% ABV – This cider is made from locally grown Granny Smith apples. It is fermented in wooden casks and stainless steel using ambient yeasts. The cider is then dry hopped with Fuggles, East Kent Goldings and a bit of Belma hops. It is dry and cloudy due to the fact that it is unfiltered. The hops bring about earthy notes to the otherwise crisp cider ending with a hoppy finish. Rackham: 7.5% ABV – There is no shortage of hopped ciders at Bristols! This is an unfiltered cider that consists of mostly Braeburn apples fermented with ambient yeasts in wood and cold steel. The cider is then dry hopped using Citra, Amarillo and Belma hops. This cider is full in body featuring citrus notes added by the hops, giving the cider almost IPA like qualities. 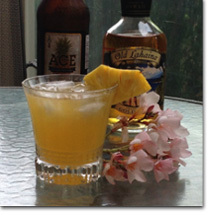 Anne Bonny: 10.5% ABV – For fans of bourbon, Bristols has a cider for you. This lightly filtered cider is comprised of mainly Granny Smith apples, fermented using ambient yeast in bourbon casks. It is then aged in the casks to infuse notes of vanilla into the smooth and tart dry cider. Skimmington: 7.5% ABV – Marrying Neil’s love for cider and wine, this farmhouse scrumpy was created by fermenting the cider in old wine casks with two strains of brett yeasts added. Braeburn apples are primarily used in this unfiltered and still cider. Mangelwurzel: 7.5% ABV – This cider is a Bristols seasonal variety and consists of Granny Smith apples and organic Bull’s Blood beets combined to perfection to create a pink colored cider that is light and tart with notes of earthiness. Black Bart: 8% ABV – Very much similar to the Barti Ddu, consisting of Granny Smith apples, fermented with ambient yeast in wood and steel. This cider is then aged and dry hopped with Fuggles, East Kent Goldings, and Belma hops. The big twist comes in the extra bottle fermentation, in which the cider is fermented using Saison yeast. This cider is well carbonated, bright, and crisp, with flavor profiles similar to that of a farmhouse ale. Black Beard: This is a bold cider at 13% ABV, created using mostly Arkansas Black apples. The cider is fermented with ambient yeast in fresh bourbon casks then left to age for eight months. The cider is then bottle fermented using champagne and brett yeast. 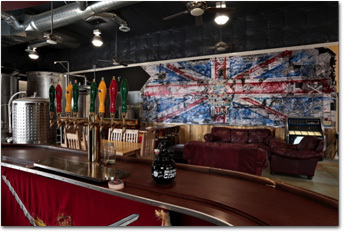 Bristols Cider House is located at 3220 El Camino Real Atascadero, CA, where patrons can buy bottles, growlers, or pints of their delicious cider. Their tasting room is open from 1-8pm PST, Thursday through Saturday, and Sunday from 11-6pm PST. 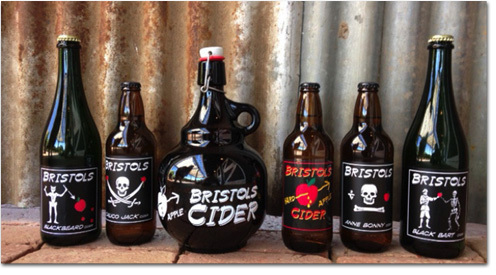 Those who are not local can purchase some of their ciders online at: BristolsCider.com. Photos courtesy of Bristols Cider. Following successful runs in Philadelphia and Long Island, Pour the Core: A Hard Cider Festival is branching off into Brooklyn. The festival will be held on Saturday, June 13, 2015 from 1:30 – 6:00 p.m. at the Brooklyn Expo Center in Brooklyn’s Greenpoint neighborhood at 72 Noble Street, Brooklyn, NY 11222. Tickets and more information are available at PourTheCore.com/brooklyn. Mark your calendars to explore the ever-expanding world of hard ciders and perries (ciders made from pears) as you join thousands of your fellow fans in tasting over 75 ciders from more than 30 different local and international cider companies. The big apple will be represented through New York City’s own Original Sin, with well known best-sellers Woodchuck Cider and Angry Orchard pouring liquid proof of hard cider’s recently found success in the United States, as well as imported international flavors via Spain’s Maeloc, Germany’s Possman, and Sweden’s Rekorderlig. The event will take place indoors but will include an outdoor “cider garden” for attendees to soak up the sun. Food will be available to purchase via New York City’s favorite food trucks serving some of the finest street foods including Dub Pies, Phil’s Steaks, and Gorilla Cheese. The festival will help raise funds for the non-profit organizations KiDS NEED MoRE and the United States Association of Cider Makers. 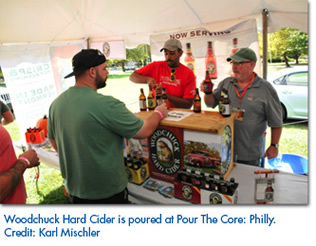 Tickets are on sale at PourTheCore.com/brooklyn for both the general admission ($40) and VIP ($55) session - both include admission into the festival, a souvenir five-ounce tasting glass sponsored by Woodchuck Hard Cider, two-ounce pour samples from all participating ciders, and access to sweet cider seminars. VIP ticketholders gain access to special ciders only poured during the VIP hour (an additional hour before the general session opens) to VIP ticketholders. Designated Driver tickets are available for $10 and include admission, seminar access, and a bottle of water. No one under 21 will be admitted, including designated drivers; valid 21+ photo identification is required for festival admittance. Come see how far the apples fall from the tree at Pour the Core: A Hard Cider Festival in Brooklyn on Saturday, June 13, 2015 at the Brooklyn Expo Center. Many great ciders have come from experimentation; Chaddsford Winery’s first hard cider is no exception. 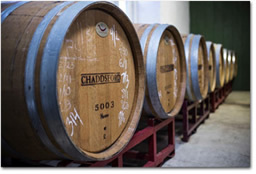 Chaddsford Winery, Pennsylvania’s largest winery, began producing wine in 1982. 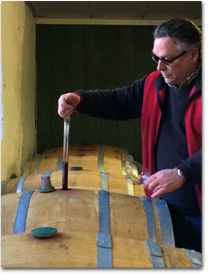 The award-winning winery was first started by Lee and Eric Miller. The winery is located in the Brandywine Valley, which is southwest of Philadelphia, and is now lead by wine maker, Jim Osborn. Osborn started with Chaddsford in 1987 and ended up taking over for the Millers when they retired in 2011. Chaddsford produces over 20 different varieties of wine; and starting in the summer of 2014, they began producing a hard cider. While Chaddsford has been producing a spiced apple wine for over thirty years, it was by chance that they recently ended up getting into hard cider. When Ziegler’s, the orchard that Chaddsford sources their apple juice from, decided to increase their minimum order by 1,500 gallons, Head Wine Maker, Jim Osborn, had to figure out what to do with this significant excess juice. He could have easily used the excess to make more spiced apple wine but instead Osborn decided to separate the extra juice and try to create something new. Osborn noticed the trend of hard cider’s rising popularity and used his wine making expertise to try his hand at making a cider. At first Osborn was not sure what style of cider he wanted to create, but he did know that he wanted an unfiltered and still cider. Knowing just those two specifications, he decided to take the 1,500 gallons of fresh apple juice, ferment it using standard wine yeast, and see what the end result yielded. The final product turned out even better than he had expected and Osborn realized that he was really on to something. The cider is an unfiltered still cider with an ABV of 6%. 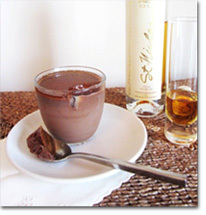 It is cold fermented with a blend of juices from sweet and tart apples. This cider is very similar to the early American styles of cider that were produced by settlers in colonial times. This cider is dry and tart with a noticeable note of Granny Smith apples. It is bottled in the same 375ml bottles that Chaddsford also uses for some of their other wines. Upon creating the hard cider, Osborn ran into a problem in which he realized that the regular screw on caps that they used for their wines were not sufficient enough to hold the cider and keep it fresh for significant periods of time. The typical caps that Osborn used for the wine were 60 x 30 screw caps from a company called ACI. While the cider is technically still, there is still a very slight carbonation present from fermentation, which created more pressure than the regular screw caps were rated for. Osborn did some research and decided to use ACI’s “fizz” screw cap instead. The new caps are reinforced with an aluminum exterior and they include a polymer insert fitted with a Saranex liner. Besides the excess pressure created with this cider, Osborn also wanted to ensure that his cider would be kept fresh. The new “fizz” screw cap creates a total oxygen barrier which does not allow outside air to enter the bottle after it has been sealed. The best part about the new screw caps is that they are still compatible with all of Osborn’s current capping equipment. This heavy duty cap turned out to be the perfect solution. Chaddsford has been seeing great success with their new cider. They have only been selling the cider in their retail location and at their winery but if the sales continue on the same trend, they expect to sell out of all of their 15,000 bottles that were produced. Osborn is already in the works of doubling production of the cider for the next year, and he will be focusing heavily on marketing the cider more within the year. Lahaska, PA 18931. For more information, visit Chaddsford.com. Photos are courtesy of Chaddsford Winery. 2 Towns Ciderhouse started to brew in a small 2-car garage back in 2010, but quickly surpassed their own expectations, maxing out their space and requiring expansion twice since they opened their doors. Hard Cider News staff had the opportunity to sit down with Head Cidermaker and one-third of the brains that started it all, Dave Takush, to get some insight into the process behind the successful ciders 2 Towns offers. The 2 Towns team developed their taste for traditional hard ciders while visiting Europe, where they were introduced to the cider culture that had not yet reached the United States. 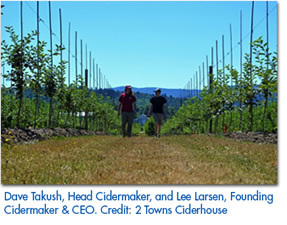 Pair together the newfound respect for all things apple, the freshest ingredients found in Oregon’s agriculturally booming Willamette Valley, and Dave Takush’s background in fermentation science (for which he went to school), and you have the perfect recipe for natural European inspired ciders. Growing to 29 employees and expanding their presence along the West Coast from Anchorage, Alaska through San Diego, California (and now including Hawaii), 2 Towns continues to offer ciders with no refined sugars, artificial ingredients, or colors, which have been met with accolade and award. “Our big thing is we want to let the fruit speak for itself,” says Takush, and with ciders boasting flavors such as rhubarb, hop, gooseberry, ginger, and marionberry, they have done just that. With production of approximately 200,000 gallons of cider a year, up from just 30,000 gallons in 2011, 2 Towns takes advantage of their growing production capabilities. Their two facilities give the cider producer 22,000 square feet of production space, containing eight fermenters ranging from 30 to 200 barrels in size, helping to further their expansion and distribution. 2 Towns started growing their own apples four years ago, and are now on a three-acre orchard growing over a dozen varieties of apples including Foxwhelp, Brown Snout, Chisel Jersey, Dabinette, Cow Jersey, Reine des Pommes and Kingston Black, among others. The cidery additionally partners with local growers to plant more acreage devoted specifically to 2 Towns. By using different apple blends in their ciders, such as Golden Delicious, Granny Smith, Rome Beauty, and/or crab apples in general, they are able to develop rich and complex flavor profiles that give each of their many ciders individual mouthfeels and personalities. 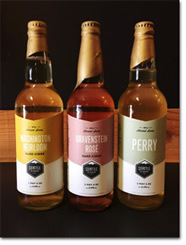 The award-winning 2 Towns Ciderhouse won the most medals of any cider producer that entered this year’s Great Lakes International Cider & Perry Competition (GLINTCAP) with sever silver and 14 bronze medals. In 2014, 2 Towns had won three gold medals in the competition. In 2014, 2 Towns had won three gold medals in the competition. Below is just a sampling of some 2 Towns ciders that are currently available. OutCider: Last month, (April) OutCider was introduced as the newest 2 Towns’ flagship cider to be available year-round in bottles. Stemming off of success in the 2 Towns taproom, the unfiltered 5% ABV cider will be available through distributors in cans, bottles, and kegs. A bit sweeter than their other ciders, but balanced with a slightly tart finish, the OutCider has the making for the perfect summertime cider. Bad Apple: Another of the 2 Towns flagship ciders, this imperial cider is a Northwestern favorite. Fermented with meadowfoam honey and aged on brandy-soaked oak, the cider delivers a dry, bittersweet taste with a slightly richer body and some scented notes of marshmallow and vanilla (courtesy of the honey and oak). Accompanied with a higher alcohol content (10.5% ABV), this cider is deceivingly smooth. Hop & Stalk: This imperial hopped cider combines dried citra hops with Willamette crimson red rhubarb and freshly-pressed apples. The tart taste from the rhubarb paired with the citrus-flavor of the hops and the champagne-like mouthfeel culminates into a slightly sour cider boasting an 8% ABV. Due to the nature of the dry-hops this cider now comes with a “freshest by” date, which 2 Towns recommends following in order to receive the best tasting product possible! 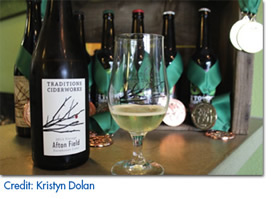 Afton Field: This farmhouse cider under the 2 Towns sister company name, Traditions Ciderworks, utilizes only Oregon’s hand-picked and freshly-pressed pioneer apples. The Brettanomyces yeast produces a very dry flavor with slight barnyard characteristics, deepened by the pinot noir oak barrel fermentation and bottle conditioning processes. The thin body and 6.5% ABV leads to an easily drinkable and enjoyable cider. Rhubarbarian: This dry tangy cider is made with fresh-pressed Northwest rhubarb and gives a tart, pleasant bitterness. The cider starts off subtly and ends with a smooth finish. At 6% ABV, this crisp drink is a refreshing option for a cider-enthusiast. Batch No. 1 – Barrel Select Blend: This cider just recently hit the shelves this month and is the first installment of the 2 Towns Cider Master Reserve Series. It is a 6.9% ABV traditional English-style cider made with a blend of the finest locally-sourced heirloom cider apples, including Ashmead’s Kernal, Bramley’s Seedling, Chisel Jersey and Newtown Pippin. The cider was aged in a variety of select vintage casks which lends a depth and uncommon character to the bold, dry cider. Less than 300 cases of this cider are available in 750 mL bottles so get it while you can! 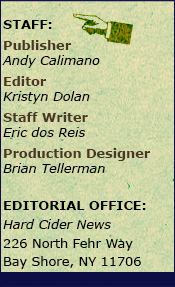 With rapid expansion and success over the past few years, the Hard Cider News Staff is excited to see what 2 Towns Ciderhouse is to bring to the cider community in years to come. 2 Towns Ciderhouse ciders are available throughout Oregon, Washington, California, Idaho, Alaska and Hawaii with limited distribution in Nevada and Minnesota; and Chicago area distribution only in Illinois. 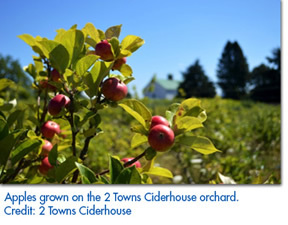 For more information on 2 Towns Ciderhouse, please visit 2TownsCiderhouse.com or TraditionsCiderworks.com. The Craft Beverage Expo (CBE) 2015, the leading conference and expo for craft producers across the entire industry, gathered together craft producers of all kinds to ban together. 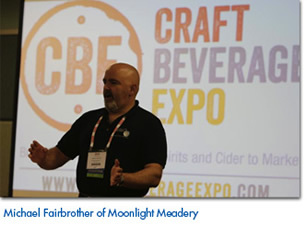 If gathering professionals in beer, wine, spirits and cider were not enough, this month, CBE 2015 expanded its audience to include mead, sake and soda segments to promote greater collaboration and innovation in the craft beverage industry. Building off of momentum from last year’s inaugural event, CBE 2015 had a sold out expo floor, which showcased the newest products in the industry ranging from label suppliers to mobile apps. 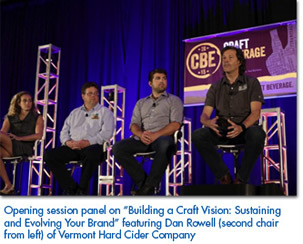 CBE also added to its curriculum, offering a total of 26 breakout sessions presented by 72 experts touching on marketing strategies, business development and real solutions to the specific problems both big and small craft beverage producers face on a regular basis. The biggest CBE 2015 attractions were the two town-hall style general session panel discussions. Led by industry trailblazers like Ralph Erenzo, Co-Founder of Tuthilltown Spirits, Joe Wagner, of Cooper Cane Wines & Provisions, and David Walker, Founder of Firestone Walker Brewing, each focused on facilitating collaboration amongst the robust craft community beyond show walls to further strengthen the efforts of small batch producers across the country. 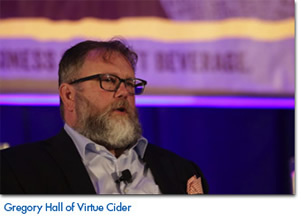 Based off of new attendance within cider, mead, sake and soda beverage industry sectors at CBE 2015, these keynotes are not alone in believing the increase of industry crossover is essential for craft producers’ success. Event further, 74 craft entrepreneurs from various market segements stayed after hours on May 8th for a 3-hour intensive in-planning workshop. Focused on “Starting Your Own Craft Business,” attending producers participated in discussions lead by top industry professionals such as Craig Rashkis of Farwell Rashkis LLP, an attorney-at-law who specializes in alcohol law, and Chief Deputy Director of the California Alcoholic Beverage Control, Lori Ajaz, who addressed legal, accounting and regulatory issues for new businesses of the various craft sectors. The third edition of Craft Beverage Expo will be held in Oakland, CA from May 18-20, 2016. Known as a “foodie haven,” Oakland is the ideal location for CBE; attendees will find several breweries, wineries and distilleries within walking distance of the convention center, and the city hosts its own international airport that is easily accessible for out-of-state guests. For more information on Craft Beverage Expo, visit CraftBeverageExpo.com. Photos courtesy of Craft Beverage Expo. Seattle Cider Company is excited to announce the release and expansion of its limited edition ‘Harvest Series.’ Introduced last year with the release of the award-winning Washington Heirloom, this year’s ‘Harvest Series’ will also feature limited releases of the growing cidery’s Gravenstein Rose and Perry. Handcrafted at the cidery each fall, Seattle Cider Company cidermakers carefully press, ferment and mature the ciders in the ‘Harvest Series’ to feature the distinct aromas and flavors of Washington-grown fruit. These limited edition ciders are now available on shelves throughout the greater Seattle, Washington area. Washington Heirloom, $14 (6.6% ABV, 1.2 Brix): The 2014 Heirloom blend places acidity front and center, featuring Washington-grown Newtown Pippin, Gravenstein and Espopus Spitzenberg in addition to ten varieties of wild-fermented French and English cider apples grown at the Washington State University’s Extension Campus in Mount Vernon, Washington. Only 350 cases were produced. Gravenstein Rose, $14 (6.9% ABV, 1.4 Brix): For this full-bodied, aromatic and slightly tannic cider, floral early-season Gravensteins are fermented, then aged in Petit Verdot barrels from neighboring winery, Crucible Wines. Only 75 cases were produced. Perry, $12 (5.4% ABV, 4 Brix): Seckel, Starkrimson and Forelle pears combine to form a woodsy, acidic, semi-sweet perry with notes of brandy and candied pears. Only 65 cases were produced. Naturally gluten-free and never from concentrate, all Seattle Cider Company products are made with 100 percent fresh-pressed Washington-grown apples and pears. Seattle Cider Company products are available in stores and on tap throughout Washington, Oregon, Alaska, Idaho, California, Illinois, Texas and Wisconsin. Find Seattle Cider near you and gain additional information by visiting SeattleCiderCompany.com. Photo courtesy of Seattle Cider Company.